Welcome to this month’s edition of Cruise News. BTN’s regular features reporter Jane Stanbury was in Montreal when Cruise and Maritime Voyages (CMV) Marco Polo visited the inland port as part of the ship's 50th anniversary cruise. It did not take much to persuade her to join the party. ON TOUR this week features RCCL’s Explorer of the Seas and a Mediterranean cruise to please a teenager. CRUISE INTELLIGENCE follows. AND FINALLY has very strong cruise connection, but don’t tell any nervous Americans! The big news from August is that a new cruise terminal in Greenwich has been approved by the Greater London Authority. Ships up to 230m long (approximately 50,000 tons) will be able to use the turnaround capability. The facility should not affect ship calls at Tilbury, the other side of the Thames and reaching generally for the East Anglia market. Called Enderby Wharf the site is less than half a mile from the Old Royal Naval College Greenwich. Plans call for an opening in 2017. "It will provide a major boost to tourism, benefit the local economy and further contribute to London’s status as a world leading city." Thomson Cruises has become the first in the UK to successfully defend a law suit by a group of passengers following a norovirus outbreak on board one of its ships. Lawyers acting for Thomson parent TUI UK said the judgment was 'of great importance to the cruise industry' in recognising that norovirus is not caused by the ship and that it is hard to prevent. A total of 43 passengers joined a class action against TUI UK, 28 of whom claimed to have suffered from a gastrointestinal illness they picked up on the Thomson Spirit. The remainder claimed breach of contract. Lawyers acting for the group alleged that the outbreak was bacterial and caused by negligence on the part of the cruise line and poor adherence by the crew to the ship's established outbreak response plan. It said that if the illness was norovirus, rather than bacterial, the ship was the source of the outbreak and the crew then failed to implement its gastrointestinal outbreak procedures. However, Louis Cruise Lines, which operated the ship on behalf of Thomson, produced test results showing that it was a norovirus attack, rather than campylobacter as alleged. 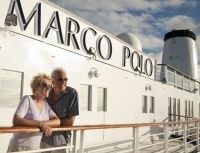 UK-based Cruise and Maritime Voyages (CMV) has marked 50 years since the launch of their iconic cruise liner Marco Polo. Launched in Wismar in the former East Germany, the Alexander Pushkin was one of a quintet of prestigious liners named for Russia’s greatest poets and writers. Second of the five, Pushkin’s sleek profile and innovative design was an instant success. Built for life as a passenger ship, her construction also took into consideration the political climate of the time and like many before her was specified for military operations should the need arise. Her first ever voyage was from the then Leningrad (now St Petersburg) to Montréal. 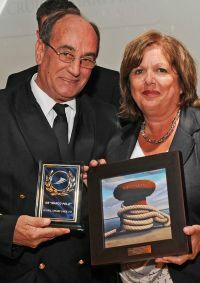 To celebrate the half century CMV chose to recreate part of the ship’s initial journey on a commemorative cruise that sailed into Montréal on 13 August. 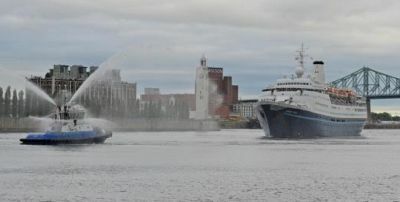 Following the original route the classically designed ship left London Tilbury docks on 24 July headed for Iceland, Greenland, Newfoundland, Nova Scotia, Prince Edward Island and finally up the St Lawrence river where a water cannon welcomed her to Quebec’s main city harbour. Built for life as a passenger ship, her construction also took into consideration the political climate of the time and like many before her was specified for military operations should the need arise. Storage and provision areas were unusually large and the cruise range was over 10,000 miles. In 1991 she became Marco Polo of the then Orient Lines before metamorphosing into Norwegian Cruise Lines who eventually sold her to the newly emerging CMV in 2010 upon completion of a major upgrading. At 22,080 she can comfortably hold up to 780 guests in 15 different styled and graded cabins ranging from an inner twin to deluxe suite ocean view allowing for everybody’s budget. On this celebratory voyage she was carrying 750 special travellers most of which were regular CMV passengers and members of the company’s loyalty programme Columbus Club. There were even relatives of some of the first passengers on board. The ship has a magical atmosphere, passengers step back in time with original features transporting them through the decades. The original swimming pool design is overlooked by an art deco statue, the dining room architecture reflects a bygone era and down deep in the hull the original engines still power each journey made. Russian’s build for durability. Visitors were checked-in and then welcomed on board by a never ending supply of champagne, wine and fruit cocktails, a mere taster of the incredible hospitality this crew offers. Serenaded in the Captain’s Club bar area by a piano and violin duo, guests enjoyed the welcome of Chris Coates, CMV’s Commercial Director. He explained that CMV were keen to showcase the appeal of the ship as it operates in a small niche market designed to attract those that want the cruise experience without the masses of the super liners. “Her traditional classic lines, her intimate atmosphere, her marvellous crew and, thanks to her ice hull, an ability to sail the seven sea makes her stand out from the crowd,” says Coates. Following the welcome guests were led to the Marco Polo Lounge which houses the stage for the ship’s entertainers. A fabulous musical show reflected the links between east and west honouring the original Russia to Canada voyage. The star of the party was the lunch which was served in the elegant Waldorf Restaurant and demonstrated what a cosmopolitan kitchen brigade, led by Executive Chef Joseph Casmire Raj, can prepare. Deconstructed Marco Polo Caesar salad was followed by the finest butter poached scallops; following a refreshing lemon sorbet guests could choose from melt in the mouth steak and lamb, grilled local salmon or a vegetable korma nodding to the nationalities cooking up the delicious delights. After the welcome in Montreal and the popularity of the celebratory cruise CMV will be repeating the trip with Marco Polo later in the year, and unsurprisingly it is already over 50% subscribed. She will also be cruising out of Tilbury and Bristol into the New Year.